For a field in 1600 m water depth offshore Angola, HEC provided one of our principals for the position of lead naval architect for an independent oil company’s first offshore development. In this position, he has developed the marine, naval architectural, and metocean sections for the FPSO basis of design, prepared invitation-to-tender documents, consulted on installation, participated in HAZID/HAZOP studies, and evaluated technical aspects of contractor proposals. Over a period of four years, HEC seconded one of our principals to a major FPSO contractor to work the front end design of the first pre-salt FPSO for Petrobras, plus two similar follow-on units. All were spread-moored VLCC conversions in approximately 2200m water depth. The focus of the design work centered on the riser support and pull-in systems and the mooring tensioningsystems plus consulting on marine engineering, stability, and hull strength issues. In the course of this work, a new-style Steel Catenary Riser flexjoint support developed with the client and a supplier was successfully tested. 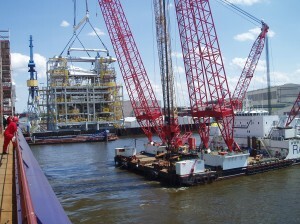 HEC developed the load management portion of the marine operating manual for a new-build Tension Leg Platform for the Gulf of Mexico, conducted the deadweight survey, then directed and ran the inclining experiment for the unit after completion of topsides integration, prior to towing to site. The load management software was developed by HEC’s partially owned subsidiary Herbert-ABS; because of this relationship, development of the manual and the software was very efficient. HEC has performed similar services for other floating productionand drilling units. HEC provided key staff, including principals and staff engineers, to Blohm and Voss Repair’s engineering team in Hamburg over the course of one and a half years to perform front end and detailed engineering for the life extension and conversion of the FPSO Uisge Gorm into the FPSO EnQuest Producer. The work included basic hull structural analysis, management of fatigue analysis, design of structural modifications for life extension and repairs, design and integration of topsides module supports, load and stability analysis, and construction support engineering for transport and lifting onboard of various topsides modules. Several members of HEC, including principals and staff engineers, were seconded to Blohm and Voss shipyard in Hamburg over the course of two years to perform the front end and detailed design for the conversion of a RORO ship into the dynamically positioned accommodations vessel Dan Swift. HEC personnel performed the stability analyses, structural design including addition of new sponsons, piping and systems design, testing and trials planning and execution, and solving regulatory issues. For UK-based client, HEC developed the concept design of a new-build VLCC-sized FPSO hull. HEC developed a hull-form with good towing characteristics that was economic to build. Design work included preparation of both double hull and single-bottom/double-side structural options, plus concept level design of the typical FPSO appurtenances including fairlead supports, topside module supports, and flare-tower foundations. HEC developed all lifting plans for a module installation campaign. The work included preparation of all lifting sequences, crane barge selection, lift equipment sizing, lift bar design, plus design of setting guides and temporary bracing. HEC engineers provided on-site supervision for the lifting operations, including coordinating with marine warranty surveyor, leading the pre-lift meetings with barge crew, shipyard personnel, and vessel owner. For a regular marine warranty surveyor client, HEC has performed analysis of seafastenings for a number of structures onboard transportation vessels. Among these structures are drilling towers and submerged mooring turrets. Services include review of contractor vessel selection and stability, verification of vessel motions and accelerations, and independent analysis of the the seafastening system. HEC has analyzed the weight, loading and stability of a number of FPSOs, semisubmersibles and spars in support of design work or to solve offshore operating problems. Projects have included deadweight surveys, analysis of damage or flooding incidents, and development of solutions to counter these incidents.